Precision Aerial Application is a core function of our business. 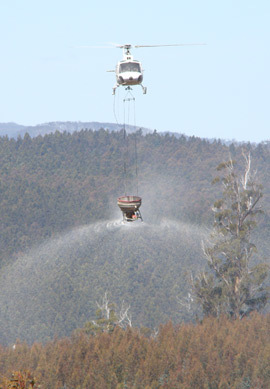 We provide aerial application services to all of the major players in the Tasmanian forestry industry statewide. The forestry industry in Tasmania has exceptionally high operational and environmental standards and Tasmanian Helicopters exceeds these expectations. We have invested heavily in equipment and ground support to remain at the forefront of the aerial application industry. All of our pilots are experts in low level precision flying and have the ability to judge conditions and respond accordingly, which is a necessity for the Tasmanian terrain. Our helicopters each have their own support equipment and ground crew and operate under a preventative maintenance system for optimum safety and reliability. By working with our clients we are able to develop and utilise specialist equipment for our precision application services, which are carried out statewide. Application of all chemical, seeding and fertilisers are carried out using Differential Global Position System (DGPS) guidance, which are fitted to each helicopter ensuring quality of application by mapping coupe locations and flight paths. This information is used as part of our quality assurance program and is copied to clients as part of our service. 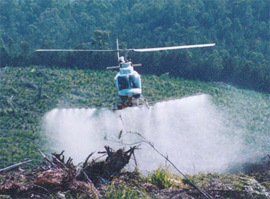 Tasmanian Helicopters are a member of the Aerial Application Association of Australia (AAAA) and accredited under the AAAA "Spraysafe" program. The Association's mission is to promote a sustainable aerial application industry based on the professionalism of operators, pilots and staff and the pursuit of industry best practice. Operators are required to meet stringent guidelines in order to achieve Spraysafe accreditation, including a full inspection of the operator's facilities. Initial accreditation requires the completion of an independent evaluation of the facilities and systems of the company against the AAAA Spraysafe checklist.